Every company wants to quickly build a large email list full of subscribers who will open emails, follow the links to offers and buy right away. Of course they do, right? So, what’s stopping your company from doing it? Unfortunately, most companies never achieve this nirvana. In fact, they usually fail at the first step: building a list of engaged subscribers. Why? They fail to publish and share quality content relevant to their target buyers. Well, today I’m going to share a shortcut with you. It’s called curation. Quite a few companies have leveraged curation — including us here at Databox — to grow big loyal email lists and convert subscribers into customers. Not everything in your newsletters needs to be written by you — or even published on your site. In fact, it may be better if it’s not. Mattermark, a SaaS web app, has a list with 80,000+ members which sources 90% of content from “various investors, founders, and media members covering the startup ecosystem”, according to Mattermark’s CEO, Danielle Morrill. Their newsletter is frequently the first way that potential customers learn about their service. They use this to consistently associate their product with valuable insights on venture capital and startups. Their formula works — they consistently achieve 70 to 80% open rates! You don’t have to start with a blank document, nor say something that’s never been said before. Don’t put that kind of pressure on yourself. Instead, start by finding existing popular content that will appeal to your audience. Then, quote a paragraph or two from the original article, link to it and expand upon it. You must add your own research, perspective, voice, and thoughts to it. A brilliant example of “remixing content” was shared by Walter Chen from iDoneThis, makers of a team productivity tool. If you’ve followed that space, you know there’s lots of software companies that help improve team productivity from project management tools like Asana, Basecamp and Teamwork to internal communication tools like Slack and Confluence. Despite this competitive field, their content gets noticed and drives business for them. In, “How to Plan Awesome Content that Grows Your Email List”, they shared a simple “hack” they use that helps them break through the clutter. They search niche industry sites, like Hacker News, for terms like “productivity”, then “remix” it. For example, a year ago, they discovered “Marc Andreessen’s Guide To Personal Productivity” was a top hit. (Andreessen is a well known venture capitalist.) They took that content — which was pre-validated, i.e. involves a big name and has some rank on industry/broader search sites — and added their own research, creating “Marc Andreesen’s Productivity Trick To Feeling Marvelously Efficient.” They spent only an hour or so to write and publish this. All they did was a bit of additional research and writing, but it was read by more than 30,000 people. At Databox, we’ve increased our content production drastically this year. As Pete Caputa, our CEO, shared yesterday, it’s helped us double our traffic and lead volume. But, before I joined two weeks ago, Pete was the only person producing and editing all of the content. In those three months, he also found time to sign up about fifty customers, visit our European team for a week, raise a funding round and hire three people. How did he do it? He tapped a community of colleagues to help him source the content. For example, twenty people contributed to his article, “16 Tips for Increasing Sales Team’s Activity”. He sourced the content for the article I published last week, “The Highest Performing Offers from 10 Marketing Agencies” using the same process. As a result, that article only took me about two hours to put together and that time was mostly just spent doing graphic creation and formatting. Yet, the article is packed with amazing original insights from our contributors and performance data I could never gather if I sat down with a blank document and started googling for landing page examples. That’s not even the best part, though. Saving time and creating better content more easily is great. But, that’s not the best thing that comes out of sourcing content from your community of customers and partners. What is, you ask? If you quote and link to your customers and partners, they will also share your content with their followers too. But, to really grow your list fast, you should also prompt your content readers to sign up for your newsletter, as they’re reading your message. Consider using a service like Sumo, Wisepops or HubSpot Marketing Free. Depending on your curation strategy and the software you’re using, build a few reports that help you monitor your success and improve your strategy. If you are simply curating other people’s content into a newsletter, like Mattermark does, look at email open rates and click through rates to ensure they stay consistent. If you’re publishing content on your site, use Google Analytics or HubSpot to measure the effectiveness of each piece of content. By looking at trends over time, you can easily determine the type of content that resonates best with your audience. 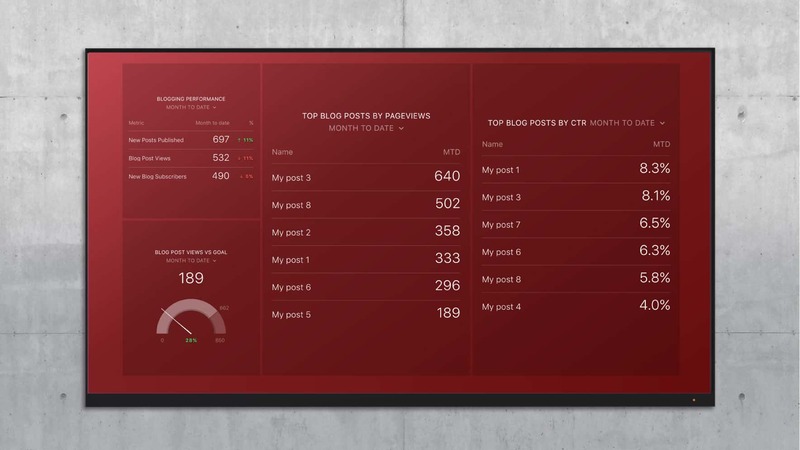 For example, here’s a dashboard for HubSpot customers that shows how different blog posts are performing. 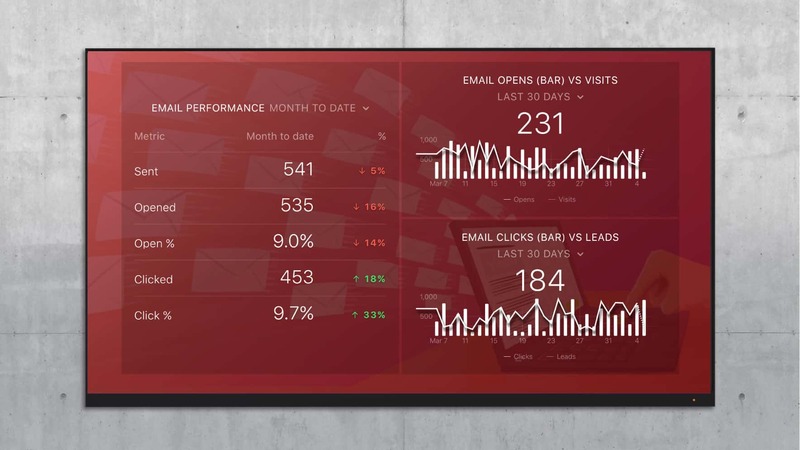 If you’re using email marketing to drive traffic and leads, use a dashboard like the one below that shows the performance of email marketing and it’s impact on traffic and lead generation. Most marketers wrongly assume they must produce a lot of original, quality content before they can build and monetize an email list. But, as the stories from Mattermark, iDoneThis and Databox’s own marketing show, it doesn’t need to all be original and you don’t need to produce a lot. In fact, the data on what your future audience wants is already out there! Get started right away by curating content that’s already validated, by adding your own spin to stuff that has worked for others and by asking your community to contribute to your articles. And don’t wait until you have a perfect plan. In reality, you don’t need that big of a list to start measuring your return on your investment. Once you get started, just tweak your content strategy by monitoring the metrics associated with each newsletter or blog post. As you get better at curating the best content, your list will grow even further via referrals and website signups. And a bigger list will lead to an even stronger ROI.